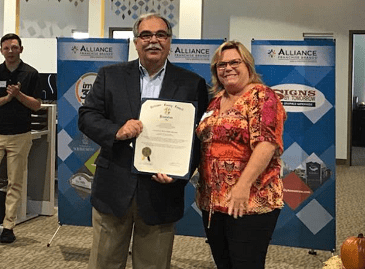 Councilwoman Cathy Bevins on Friday attended the Grand Opening of the new Alliance Franchise Brands Sign & Graphics Division new location on Crossroads Circle in Middle River. Alliance Franchise Brands, LLC is a world leader in marketing and visual communications. Independently owned and operated franchises provide national, regional, and local businesses and organizations with a one stop resource for technologically advanced and strategically sound solutions for their graphics communications needs.